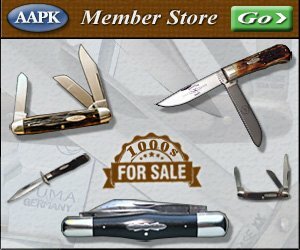 The pictures below shows almost every style of blade that you will find on a Case knife. Case generally uses either TruSharp surgical steel or chrome vanadium. They have produced a few knives using damascus steel and ATS34. ATS34: This is a high-carbon, high-alloy, stainless steel. Case knives made with ATS34 will be stamped ATS34. Chrome Vanadium: Chrome vanadium was the first type of steel used by Case in making blades. Blades made of this steel hold their edge longer and are easier to re-sharpen. They are less resistant to rusting, pitting, and discoloration than TruSharp surgical stainless steel. Most new Case brand knives made of this material have CV stamped on the blade. All older Case knives that are not stamped SS, SSP, or Stainless will be Chrome Vanadium. Damascus: Arguably, this is the most beautiful steel used in knife making. It is layers of different steel welded and layered together to form an intricate design. See illustration Most Case knives made from damascus will be stamped with a D.
TruSharp Surgical Steel: This material is a high carbon stainless steel that is easy to maintain and more resistant to rust than chrome vanadium, but does not sharpen quite as well or hold an edge as well. All Case knives with this material will be stamped SS, Stainless, or SSP. Case currently uses 420 HC steel in its TruSharp Surgical Steel blades.